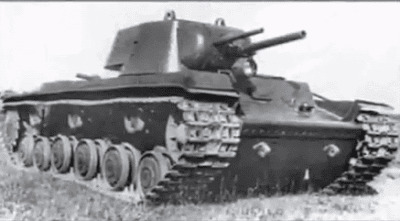 In 1939, Joseph Kotin developed a heavy tank that would later become known as the KV-1. This heavy tank had thick, sloped armour, and a powerful gun. In 1941, that tank became the platform of choice for the development of a heavy assault gun. Reports from the front suggested that towed artillery cannot rapidly follow advancing tanks and infantry. A tank that could bring the firepower of several field guns was needed. Initial KV prototype. Unlike the multi-turreted SMK and T-100 tanks that competed with it, both guns were combined in one turret. The first solution to this problem was quite original. Despite his initial dislike of the KV-1's two guns, Stalin gave the order for a three-gun mount. Two guns made the KV's turret crowded enough, so the turret had to go. The result resembled the ultimate conclusion of that project, the SU-152. A front fighting compartment on the KV-1 hull, with up to 100 mm of front armour, fully enclosed from all sides. The armament is where the construction differed radically. Instead of the commonly seen one gun, the new SPG (indexed KV-7) had multiple. Different versions had 2 45 mm model 1932/34 guns and 1 76 mm F-34 gun (U-13), and 2 76 mm guns (U-14). Regardless of the configuration, the guns shared a mantlet, and aiming mechanisms. The guns could either fire independently, or all at once. The three gun variant stored 93 shells for the 76 mm gun and 200 45 mm shells. The two 76 mm gun variant had 150 shells. 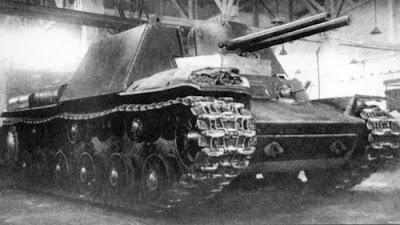 KV-7, first variant. The second 45 mm gun is almost completely covered by the 76 mm gun. From Solyankin et al, Soviet Heavy SPGs 1941-1945. 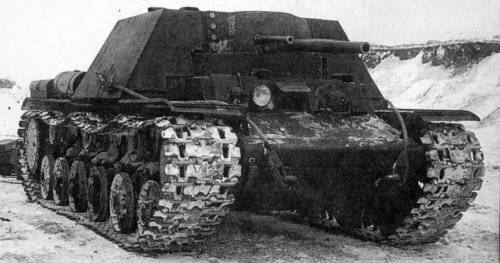 KV-7, second variant. From Solyankin et al, Soviet Heavy SPGs, 1941-1945. At this point, Stalin seems to change his mind. "Why have three guns? Put one in, but a good one!" However, his opinion of the developments was not entirely negative, as he promoted Kotin from colonel to general on that same day. 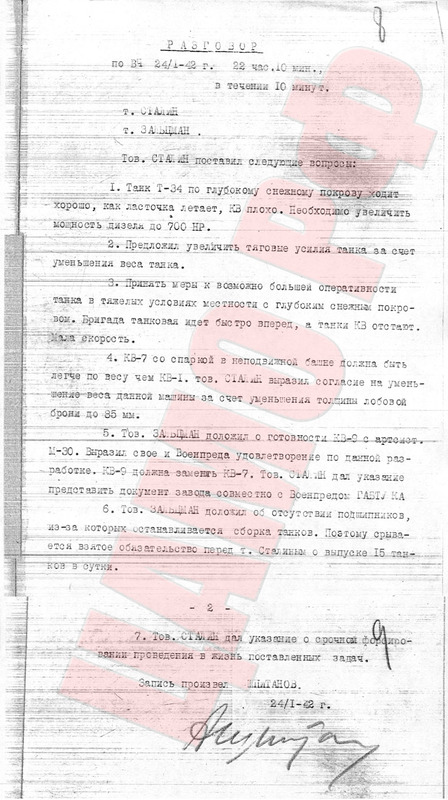 The KV-7 comes up in a phone conversation between Zaltsmann and Stalin on January 24th, 1942. 4. The KV-7, with two guns in a fixed turret, must be lighter than the KV-1. Comrade Stalin agrees that it should be made lighter by reducing the front armour to 85 mm. 5. Comrade Zaltsmann reports that the KV-9 project with an M-30 artillery system is ready. He is satisfied with the project, as is the GABTU representative at the factory. 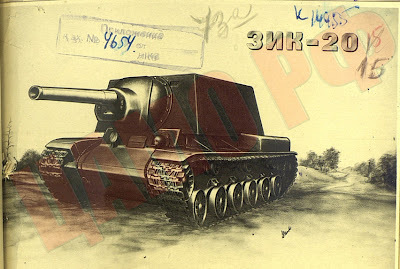 The KV-9 should replace the KV-7. 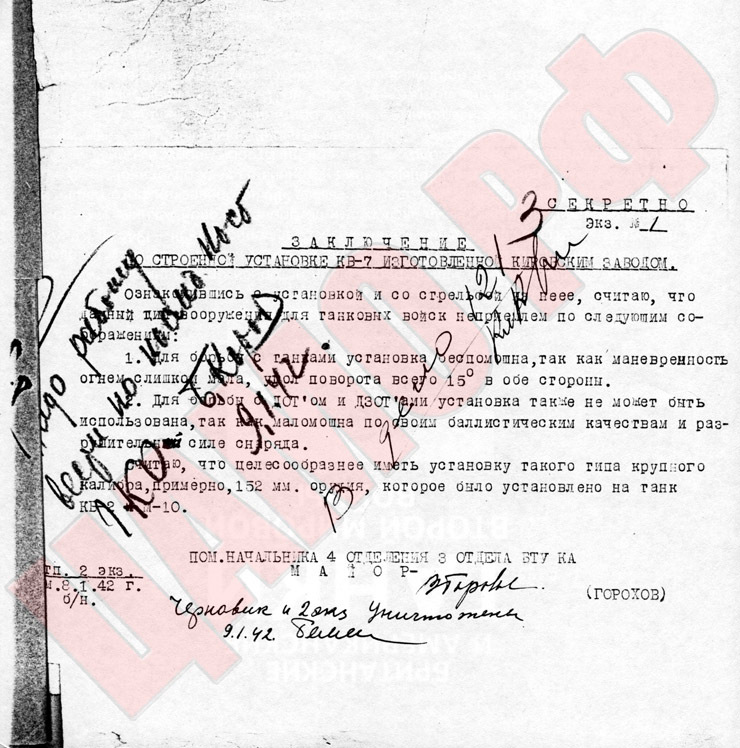 Comrade Stalin requests that the factory and representative prepare a document for him. More solid criticisms were compiled by assistant of the head of the 4th division, 3rd department of GABTU, Major Gorohov. 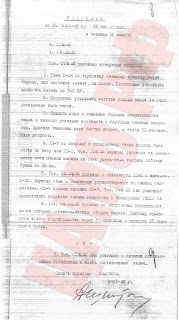 "Conclusions on the KV-7 self propelled gun mount, manufactured by the Kirov factory. It is helpless when fighting tanks. The angle of fire is only 15 degrees to each side. It cannot be used to combat concrete bunkers, as the caliber is too small. I think it is more reasonable to install a large caliber gun, approximately 152 mm, like the M-10 gun on the KV-2." And so the KV-7 idea was buried. However, the need for a heavy SPG was not. At Uralmash, two SPGs were in development in this time: U-18 and U-19. The vehicle had 75 mm of armour at the front, 60 on the side, 30 on the roof (which was removable to facilitate loading). The mass of this project reached 66 tons, and height was 3505 mm (even taller than a Maus). The gun was the powerful 203 mm B-4 howitzer. 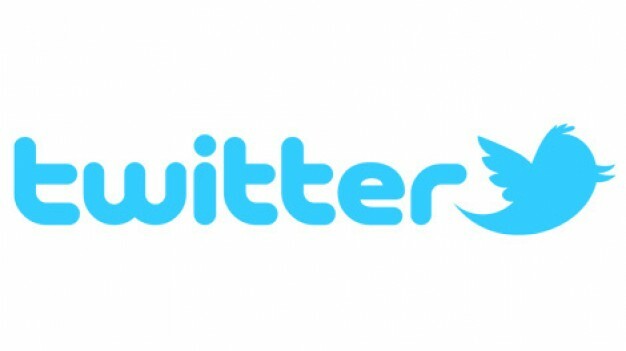 The project was very short lived, and was declined in September of the same year. 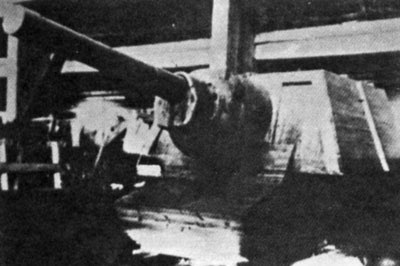 The U-18 mounted a ML-20 howitzer in the KV-1 hull. This project was a lot more successful, serving as a base for the SU-152 project. The U-18 wasn't the only project to put a 152 mm gun on a KV-1, and factory #8 wasn't only dealing with medium SPGs. Another project of theirs was the ZIK-20, an ML-20 gun mounted on a KV chassis, started in Spring of 1942. Front armour was 105 mm, side armour 75 mm. This looks like a taller SU-152, but with one interesting difference: there is no muzzle brake. The project made it as far as a wooden model. However, at that point, the KV-1 ceased production, and the KV-1S was to be the new heavy SPG base. However, before the ZIK-20's demise, it was equipped with an even more optimistic artillery system: a Br-2 152.4 mm gun. In order to offset the massive gun, the front armour was reduced to 75 mm (or 60 on a KV-1S chassis). 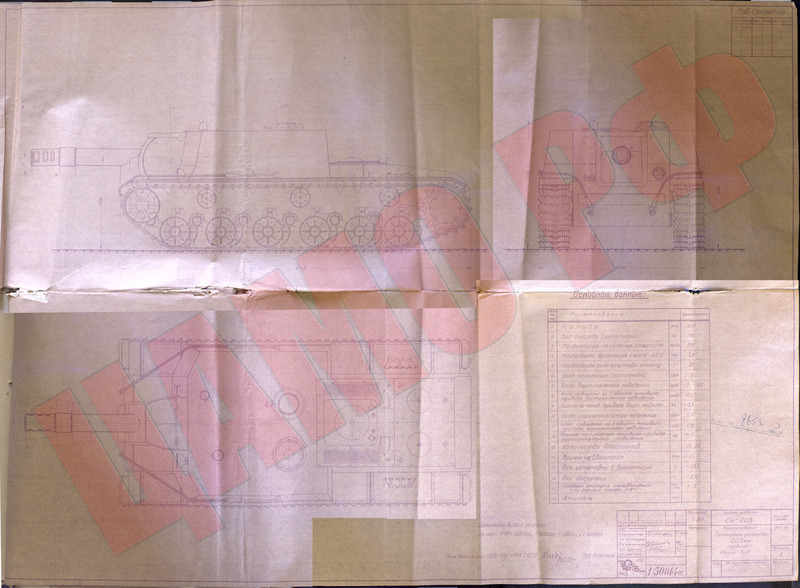 The accompanying document also states that, since the Br-2 uses the same mount as the B-4 and U-3 203 mm howitzers, it is possible to install them in a ZIK-20. This project was never built, but the idea of a high powered 152.4 mm gun in an SPG remained for a few years. Another attempt at a 203 mm gun was undertaken at Perm in 1943, indexed SU-203. A "SU-14 type" SPG was equipped with a 203 M-4 mortar, based on the B-4 howitzer. The ammunition used by the two was the same. 20 100 kg shells were stored inside the tank. From Solyankin et al, Soviet Heavy SPGs, 1941-1945. The gun mechanisms were so massive, that the driver had to be moved to the right. The fighting compartment got much smaller, pushing out the gunner. His position, as on the T-34, was filled by the commander. As for mass, the M-4 was previously used on the ML-20 mount with no modifications, as corps level artillery. The resulting SPG would not have been significantly heavier. However, bigger is not necessarily better. Due to the short barrel and low velocity, the M-4 could only penetrate 80 cm of concrete, where the ML-20 could penetrate 140 cm. The Br-2 that engineers tried to cram into a ZIK-20 could penetrate 2 meters of concrete. Great articel .. very helpfull. It clears up all the questions which rised before when it comes to the SU prototyps. Do you think they could make it in WOT? Hetzer? I hardly know 'er! World of Tanks: Today in History: "Tank Wings"